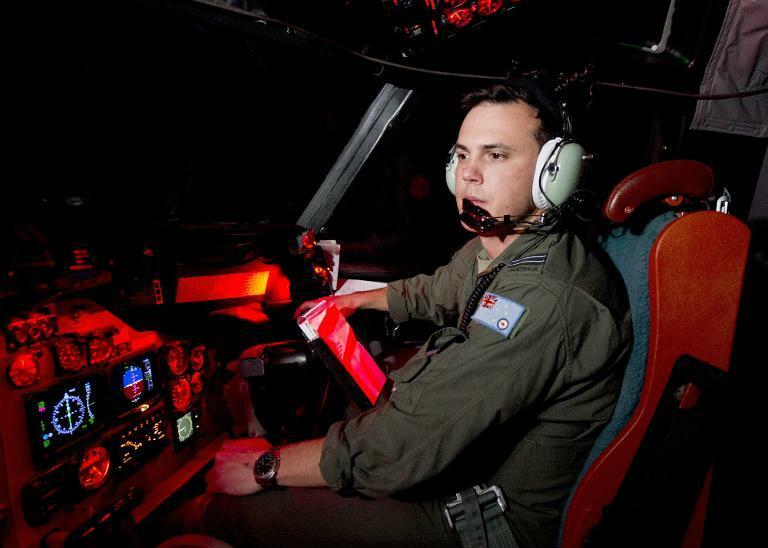 An Australian plane searching the vast Indian Ocean for signs of missing flight MH370 spotted two objects on Monday which Malaysia said could be retrieved by a ship within hours. 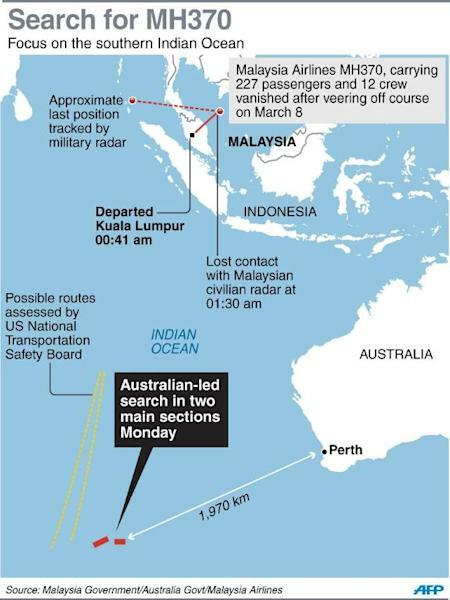 There was no initial confirmation that the objects were linked to the Malaysia Airlines passenger jet but their sighting added to mounting reports of debris that have energised the huge multinational search for the plane two weeks after it went missing. Crew members of an Orion plane "reported seeing two objects, the first a grey or green circular object and the second an orange rectangular object", Australian Prime Minister Tony Abbott told parliament on Monday evening. Australian officials made clear they were different to pieces seen by a Chinese plane earlier in the day. The Australian naval ship HMAS Success, equipped with a crane, was in the area, about 2,500 kilometres (1,562 miles) southwest of Perth, and would attempt to recover the objects. 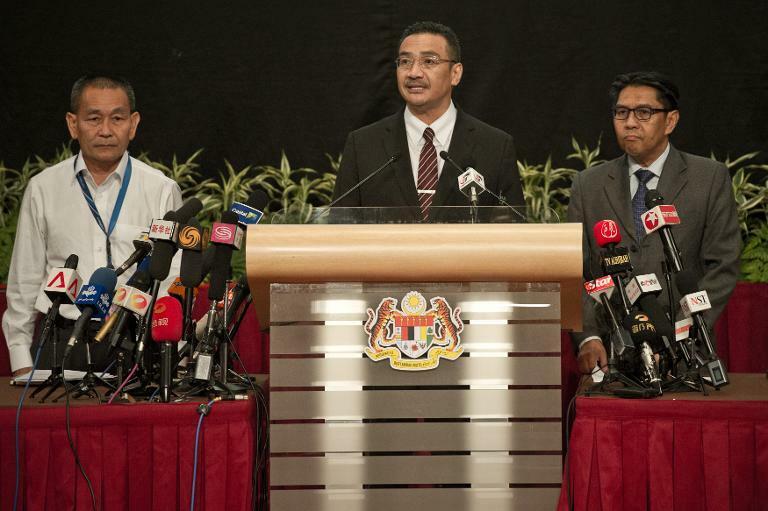 It was possible "that the objects could be received within the next few hours, or by tomorrow morning at the latest", Malaysian Transport and Defence Minister Hishammuddin Hussein told a press conference in Kuala Lumpur. After days of tantalising leads that have failed to pay off, Abbott cautioned that it was not known whether the objects came from the missing Boeing 777. "Nevertheless we are hopeful that we can recover these objects soon and they will take us a step closer to resolving this tragic mystery," he said. China's Xinhua news agency earlier said a Chinese air crew spotted "two relatively big floating objects with many white smaller ones scattered within a radius of several kilometres". But a US search plane was unable subsequently to locate them. However, hopes of a resolution to the mystery have risen after a weekend in which an Australian aircraft spotted a wooden pallet, strapping and other debris, and French and Chinese satellite information also indicated floating objects far off Australia's west coast. The US Navy added to the sense of an approaching denouement, ordering a specialised device sent to the region to help find the plane's "black box" of flight and cockpit voice data -- crucial in determining what happened to the plane. The high-tech device can locate black boxes as deep as 20,000 feet (6,060 metres), the US Seventh Fleet said in a statement. The search area ranges from 3,000-4,000 metres deep. The move was taken to ensure that black box detection can start "as quickly as possible" after confirmed debris is found, it said. The 30-day signal from the black box is due to fail in less than two weeks. MH370 vanished without warning on March 8 over the South China Sea en route from Kuala Lumpur to Beijing with 227 passengers and 12 crew on board. Malaysia believes the plane was deliberately diverted by someone on board. But the absence of firm evidence has fuelled intense speculation and conspiracy theories, and tormented the families of the missing. The search swung deep into the Indian Ocean last week after initial satellite images depicted large floating objects there. The Australian Maritime Safety Authority said the search grew to 10 aircraft on Monday with the inclusion of two Chinese military aircraft -- two thirds of passengers were Chinese -- joining Australian, US, and Japanese planes. China has also dispatched seven ships, adding to British and Australian naval vessels involved. Satellite and military radar data suggest MH370 backtracked over the Malaysian peninsula and then flew on -- possibly for hours -- to parts unknown. Leading theories include a hijacking, pilot sabotage, or a sudden mid-air crisis that incapacitated the flight crew and left the plane to fly on auto-pilot until it ran out of fuel. Hishammuddin said Malaysian police have interviewed more than 100 people, including families of both the pilot and co-pilot. If a crash is confirmed, recovering the black box will be far more difficult than for the Air France jet that went down in the Atlantic in 2009, said Charitha Pattiaratchi, an oceanographer at the University of Western Australia. "We have to remember that Air France 447 took two years to find and this is a more challenging region where the environment is much, much harsher. There are bigger waves and it's windier," he said. Angry relatives shouted at the Malaysian ambassador to China at a meeting in Beijing on Monday as frustrations over the lack of information on the missing flight boiled over once again. "Respect life, give us back our families," they called, using the phrase that has become their slogan. Hishammuddin said the search "has taken us half way around the world", with new leads at the moment but nothing conclusive. "Our thoughts continue to be with the families who are still waiting for news." Malaysia Airlines suffered more bad news early Monday when a flight from Kuala Lumpur to Seoul had to divert to Hong Kong due to a malfunctioning electrical generator. The airline said back-up systems kicked in and the plane, with 271 passengers, landed uneventfully.